There is new trend around from quite a sometime of wearing a lip sticker/tattoos as a lipstick just saw them around while ago and wanted to try them badly and recently got some from the kkcenterhk. I'm writing a review on kkcenterhk's products for quite a long time and found their products are very high quality. kkcenterhk is an online store, they bringing you outstanding value beauty, grooming and health products. They recently added the range of temporary lip tattoo on their website, there were almost around 150 different colors and designs of tattoos to made me confuse about to which pattern should I go with. 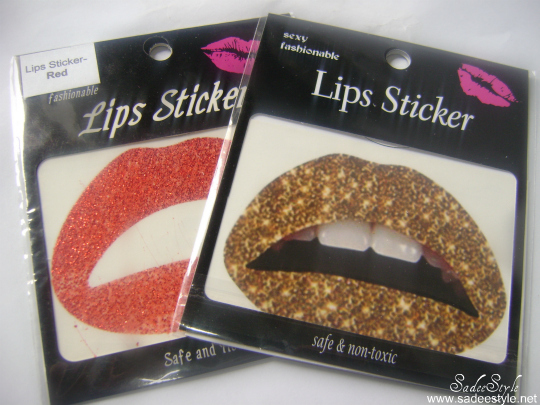 After looking around I chosen two of them in Golden (Lips Sticker Gold Cross Star Pattern Temporary Lip Tattoo) and in red (Lips Sticker Red Shiny Glitter Temporary Lip Tattoo Sticker). Although there are various range, design and pattern to choose, all of them were appealing but the two I had chose were looking more beautiful and natural. 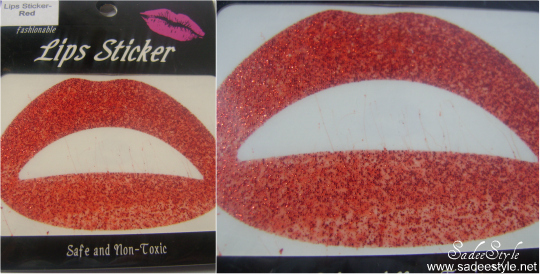 Every pack contains one lip tattoo and they are very easy to apply you can see the instuction guide behind the card for the first them pop up them out of the paper and trip them as your actual lip shape there is also a marking back of the tatto to show you that how to crop them it looks. Or remove by Baby oil or Cleansing Oil. Do not use or eat any oily and gummy things over the lip sticker. That was my first attempt and was quite successful but im really not impressed with the color and pattern, was looking more glittery and shiny on the image but when i wore it, it was dull or maybe not suited to my skin tone. Second attempt was also successful and I really love the color and glitters. it was'n looking that great when it was on the card but the result on the lips were totally different color is very appealing and charming did'n ever get the same effect with any lipstick or lip gloss i really loved it. I like the concept and was very excited when I got my hands on them. I had very high expectation with these tattoos but I would like to say that I'm really not impressed. I mean it looks little wired like you put a plastic on your lips and was very irritating also most of the colors and pattern are odd and unnatural, they might be suitable for Christmas, or Halloween but i don't think we could wear them in daily routine also they are not very long lasting as they describe them that they will last for a 4 or 5 hours and they are bit expensive no one want to spend 5.50 dollar for just one sticker they should at least add 3 or 4 stickers into the pack if you ruin one than you have another to reapply I'm a bit disappointed with the golden color but the red one is really pretty these are safe, non-toxic and transferred by water. For order and more detail visit kkceterhk Temporary lip tattoo. It looks amazing . I guess it gives your lips a pumping look or its your own lip looks ? Oh lovely pout <3, u done a great job, fix very neatly, love the Red Glitter one. Such type of tattos make our makeup easy. I've been thinking of trying these for a while:) Thanks for the review! Oh my gosh, that looks so so cool! Me and my friends were discussing this at the weekend. How long roughly do they stay on the lips for? And how do you remove it. Great review post btw!! And thanks for becoming my newest follower!! I like the second one better too. Really nice color. Wow this is so strange/different. I want to try one now! i bought the glitteratti pink ones! i wore it for nye! i lovedd how it looked but then i found they started to peel at the corners and looked stupid after :( so i had to rip them off! they only lasted me for like 2 hours too =.="
Those look awesome! But I think I'd only wear to Rocky Horror Picture Show where they'd be entirely necessary. Wow these look great on your lips :) I've wanted to try them, but I don't want to spend my money on something so gimmicky. Looks really good on, I have a gold glitter one but havn't attempted to put it on yet! I'm loving the red one. No actually they both look great on you. aww these are pretty cool! Thanx for stopping by my blog I am now following you back!!! thanks for your interest for my blog!! Thanks for following, I'm following you too! thanks so much for following me, I'm following you back! 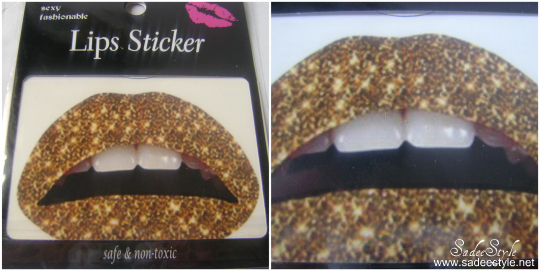 these lipstick stickers are wonderful! Hey girl you have a nice blog. Thank you so much for your comment, You have a new follower as well and also I follow you in Google +. 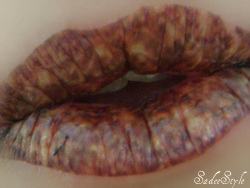 I've been reading a lot of reviews on these lip tattoos and the more I read the more I want to try them! Great post!